Does learning Torah have an inherent purpose independent of all else, or is its mitzvah instrumental in achieving other ideals? With zman matan Torateinu approaching, it is worthwhile to understand the multi-faceted nature of learning the Torah that we are about to receive. When Hashem places Adam in Gan Eden, the stated intention is “le-ovdah u-leshomra” – “to cultivate and guard it.” According to Chizkuni, this means watering the land as well as guarding it from the possible damage of trampling animals. But Rabbeinu Bachya brings a midrash that explains that the idea of cultivation and guarding relates to engaging in Torah and keeping mitzvot. Seemingly, Chizkuni and Rabbeinu Bachya provide two entirely different conceptions of Adam’s role in Gan Eden. In some contexts, we see that Torah is instrumental for another purpose. For example, there’s the famous debate between Rabbi Akiva and Rabbi Tarfon about the primacy of talmud versus ma’aseh. We conclude that learning is primary because it leads to action. Our ability to perform mitzvot and other actions in this world is based on our education. Rabbi Yishmael teaches in Pirkei Avot that one who learns in order to teach will be successful in learning and teach. But one who learns in order to act will be able to learn, teach, “guard,” and act. There, Rabbi Ovadiah of Bartenura explains that this was the difference between the Talmudic sages Rava and Abaye. Rava was not involved with gemilut chasadim; his learning sufficed, even though he should have been doing chesed. But Abaye’s learning was more complete because it was accompanied by chesed. Additionally, Rabban Gamliel teaches us that Torah should be accompanied by derekh eretz because Torah without labor will be lacking and cause sin. But we do have biblical verses that speak of Torah being the totality of one’s being. For example, “let not this Book of the Teaching cease from your lips, but recite it day and night.” If Torah is never to depart from one’s lips, how can one be engaged in any other pursuits? According to Rabbi Shimon bar Yochai, this verse can be fulfilled merely be learning once at the morning and once at night, or even by saying Shema twice daily. Rabbi Yishmael, however, disagrees, stating that there’s no hour that’s not “day and night” to allow room for other pursuits. Another Gemara reports opposite perspectives. The Torah tells us that we are to collect our grain, but what about the verse from Sefer Yeshoshua? Rabbi Yishmael holds that one has to labor, while Rashbi asks: “what will be of our Torah” if we are always laboring?! Some solutions might be: work enhances or accompanies Torah so that it is part and parcel of our actions; it matters what economic and political situations apply to Jews at that moment; or perhaps we’re trying to understand what the complete mitzvah of Torah would ideally be. Rav Aharon Lichtenstein zt”l offers two models of serving God, based on the verse “In all your ways know Him.” This could have a broad meaning in which one’s work, pending the why and how one engages in this work, is part of one’s avodat Hashem. Alternatively, we might understand that matters specifically related to avodat Hashem are the primary ways of serving Hashem. He argues that on the one hand, we cannot devalue those who engage in “constructive endeavors” for society, as one can find Hashem in these spheres as well; on the other hand, we should strive and maintain an ideal of maximizing our Torah as a more direct way of knowing Hashem. 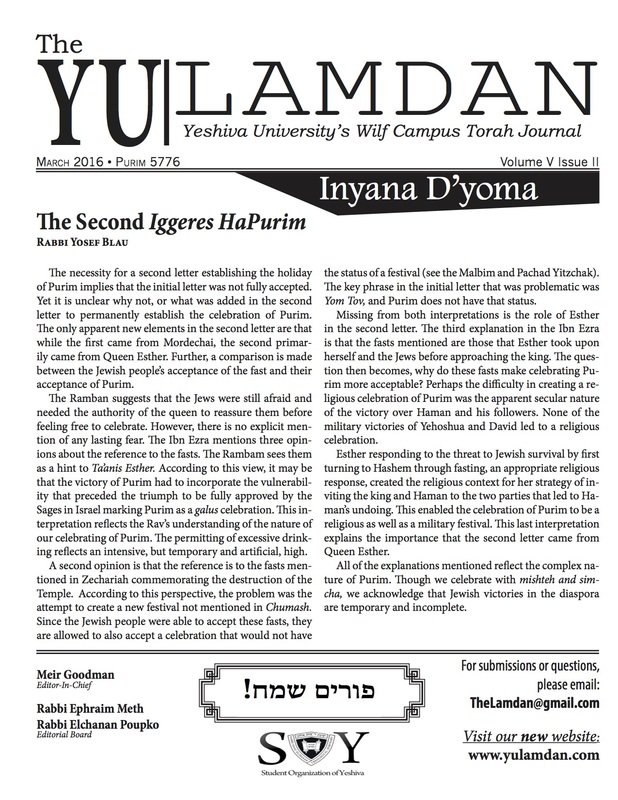 Indeed, we might find this tension in the Rambam. It is clear from the Mishneh Torah and the Moreh Nevukhim that knowing Hashem is our chief purpose. Still, one needs to make a living, and normally that cannot be from Torah alone. See Rav Yaakov Neuberger shlit”a’s article in the 44th edition of Beit Yitchak, p. 563-573 for a much more sophisticated analysis of these sugyot. The verse is Mishlei 3:6. See Rav Lichtenstein’s sicha “In All Your Ways, Know Him: Two Modes of Serving God” in By His Light, p. 27-48. See the Tur Orach Chayim 156, where he paskens that one must work to make a livelihood, but Torah should still ikar. See also Rambam Hilkhot Talmud Torah 3:3. See the Moreh, 3:54; Mishneh Torah Hilkhot De’ot 3:2; Hilkhot Melakhim 12:5; Hilkhot Teshuva 10:6. I left out the story of Rabbi Shimon Bar Yochai’s years in a cave learning Torah found in the Gemara Shabbat 33b. While undoubtedly relevant for this topic, I chose not to include it in the interest of space. It deserves many pages of discussion on its own.